Remember the internet meme “Ceiling Cat“? 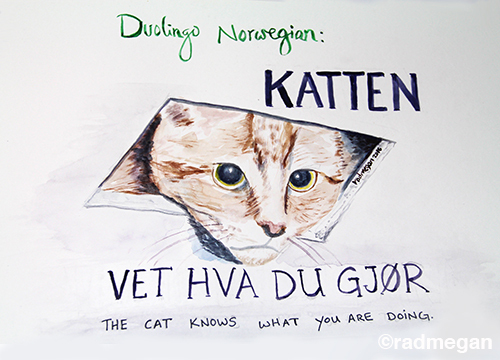 I thought of him as soon as I saw the recent Duolingo Norwegian language lesson “Katten vet hva du gjør” which translates to, “The Cat Knows What You Are Doing”. In case you missed it, this was my first Duolingo inspired painting. I’m a little bit obsessed with my daily lessons, and am painting some of my favorite phrases. I need to work on my lettering, but I’m happy with the way the cat turned out. Never forget ceiling cat, or that he knows what you are doing.